As I watch my parents, aunties and uncles get older, they appear to have two things in common. First, they all have a long list of aches and pains, for which they pop pills or endure invasive surgeries. Second, physical activity has never been a significant part of their lifestyle. Falls, mood disorders and medical conditions such as cardiovascular disease and stroke are more likely as a result. We can’t stop time but we can make positive choices which affect how we look and feel as we age. What we think of as ‘inevitable’ signs of aging can be mitigated by regular physical activity. My grandfather, for example, lived an active life until he died at 101. Living by the sea in Sicily, he took his heavy, wooden rowing boat out every day ’til he was 85. When he could no longer handle the boat solo, he walked around the village and along the esplanade. Inspired by my Nonno, I am determined to live independently and continue doing the things I enjoy – tennis, cycling, swimming, traveling – for as long as possible. Maintaining cardiovascular health, muscular strength, core stability, balance and flexibility are key to remaining in good physical and mental health well into your later years. Katy Bowman calls this “dynamic aging”. Unfortunately, 9 out of 10 older Australians don’t exercise enough. My oldest and most dedicated client, Margaret, grew up in rural Queensland. She recalls running several kilometres to school and back every day. Physical activity wasn’t something you did but a way of life. Turning 78 this month, Margaret is highly energetic and highly engaged. She is living proof that age is just a number. Margaret has as been a member of the same gym for almost 30 years and trains 2-3 times a week. Outside the gym, she walks her Jack Russell named Gina, tends to her garden and stays mentally sharp studying history and French, puzzles and traveling. I just want to stay in the best shape I can both physically and mentally to continue doing the things I like to do in later life. Wanting to manage her weight and retain functional mobility, Margaret and I started working together two years ago. Personal Training keeps Margaret focused on her goals and she tackles everything I throw her way: the rowing machine, dead balls, and even battle ropes (her least favorite exercise). A knee reconstruction last year forced Margaret to slow down for a period. 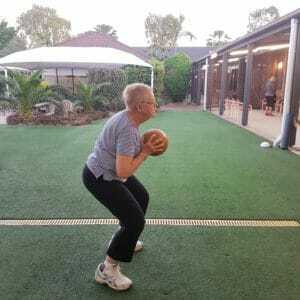 Upon returning, we focused on strengthening her knee and increasing mobility via functional exercises, such as supported squats and lunges, leg extensions and leg curls. 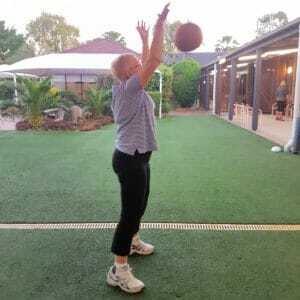 Regular exercise prior to surgery and focused rehabilitation ensured a smooth recovery time and got her back to doing the things she loves more quickly. My mother-in-law is another example of someone who understands dynamic aging. If you want to look, move and feel younger, get active. It’s never too late to start. Personal Training can benefit everyone, particularly if you’re not sure what type of exercise you should do, the appropriate intensity, or you’re concerned about an existing injury or condition. I don’t believe one-size-fits-all and will work with you to meet your unique needs and goals. Questions or concerns about exercising as you get older? Get in touch. I’d love to hear from you!